Today, Malaysian Riders will be looking at a stuff that can be a great companion for any riders out there. Having a bike and riding it is surely a joy thing to do, but once in a while we will face with some situation that we couldn’t avoid like bumping to a car or accidentally drop our bikes. Then it happen, we look at our bikes and there’s a small crack on the fairing. Replacing the whole fairing would cost too much and will be an unnecessary expense for just a little crack. Thus, most of us tend to just ignores it move on and keep using our bikes with that small cracks. These little things can worsen over time and when it happen, you know that your pocket will have to be emptied. But all this may be avoided with a quick fix and this one little thing can be a great help. 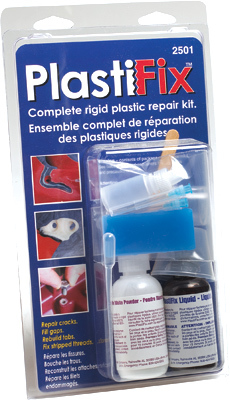 PlastiFix is a two-part methacrylate adhesive system which consists of a powder and a liquid. When the powder and liquid are mixed together, they form a solid in about 10 to 15 minutes. The adhesive cures rock hard in about an hour and a half.The most unique thing about the PlastiFix kit is that it allows you to replace pieces that are completely missing! Each kit comes with a FlexMold molding bar. When heated in boiling water for about two minutes, the FlexMold bar softens and can be formed around a pattern to create a mold. Once it cools, you peel it away from the pattern and you’ve got a perfect impression of the piece you want to replace. Affix the mold in the repair area and fill with the PlastiFix adhesive mixture. When the adhesive cures, peel away the mold and you’re finished! Best of all, the FlexMold bar can be reused again and again.